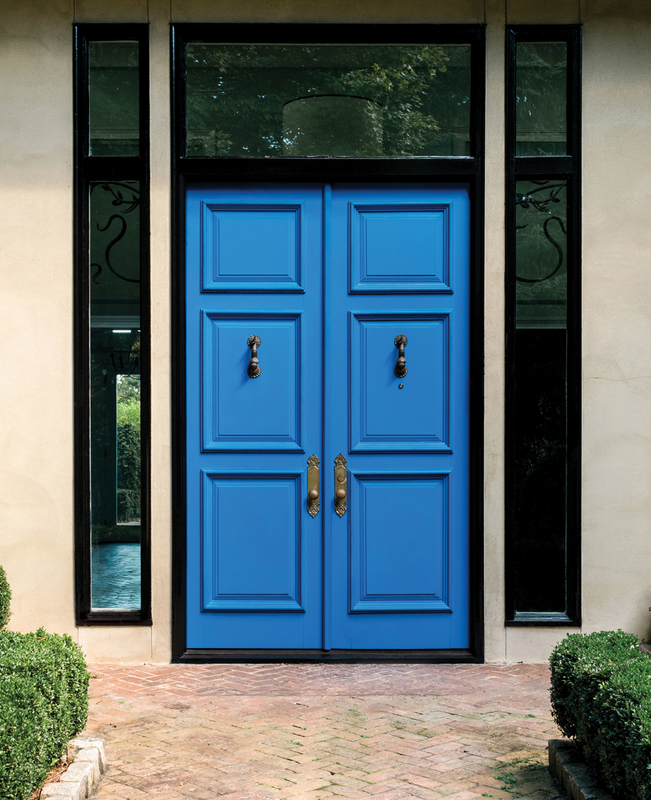 Painted a showstopping, glossy cobalt blue (“French Blue” by Fine Paints of Europe), these three-panel double doors emphasize symmetry and add grandeur to a 1963 modern Mediterranean-style stunner in Buckhead. The ornate, original brass hardware and classic herringbone brick (which continues inside) contrast with modern elements like the streamlined transom window and sidelights. Once the home of famed Atlanta Symphony Orchestra conductor Robert Shaw, the house landed the cover of House Beautiful in 1966. 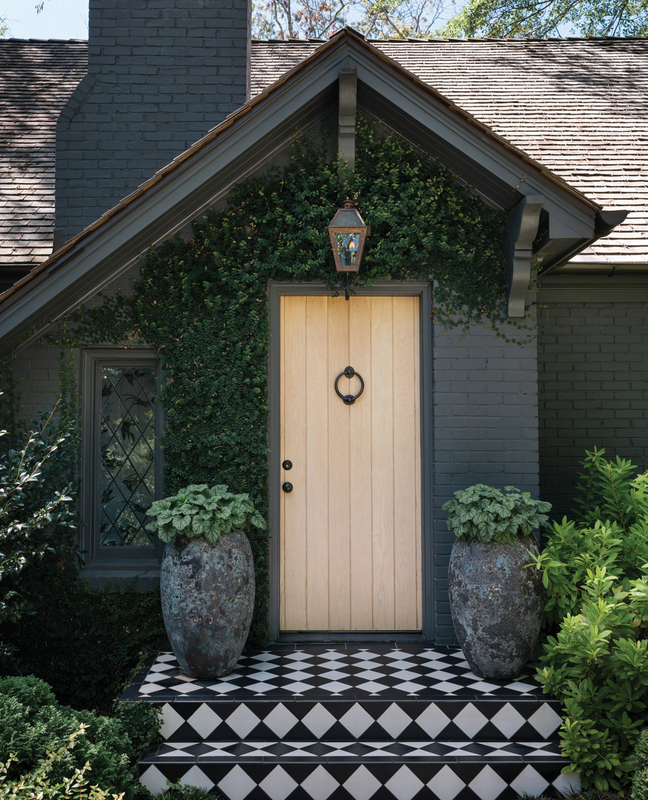 Hedgewood Homes builder Pam Sessions was inspired by the checkerboard stoops of London for the entry to her own Garden Hills home. She replaced the plain brick with black-and-white porcelain tiles laid in a pattern she devised. 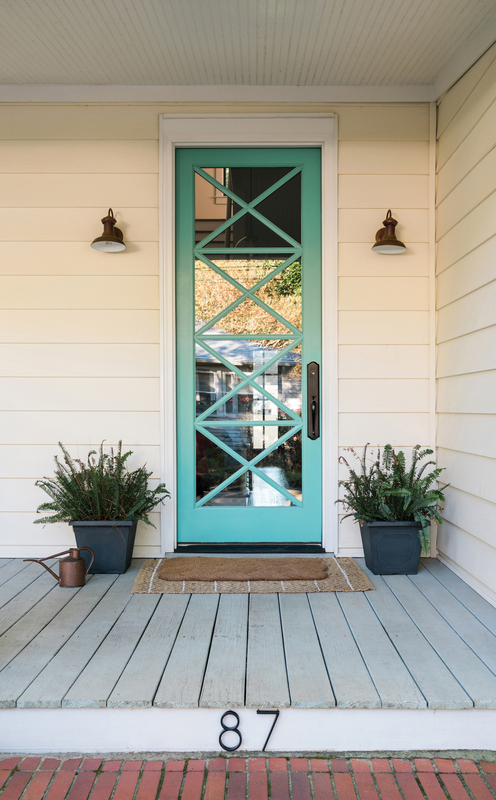 The white oak door was sandblasted and finished by Keystone Millworks with a pickling stain and clear coating, and the impressive, European-style knocker, which Sessions paired with a simple knob, is Matthew Quinn Collection. A copper gas light, tall clay pots, and creeping fig add Old World romance. “Vines and hedges help create a sense of time and wonder,” says Sessions.